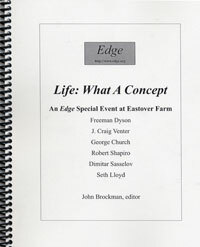 Edge has posted as a free online publication the complete transcript of this summer’s Edge event, Life: What a Concept! as a 43,000- word downloadable PDF book. This is a transcript of an event that took place at Eastover Farm in Bethlehem, CT on Monday, August 27th, 2007. Invited to address the topic “Life: What a Concept!” were Freeman Dyson, J. Craig Venter, George Church, Robert Shapiro, Dimitar Sasselov, and Seth Lloyd. These scientists are some of the most visionary scientific thinkers in the world. Warning: this is heaving going ….